This month turned into quite a pursuit of experimenting with new things I haven’t made before (cake pops & punch!) but I’m so pleased with both choices because they left me with new recipes I love & some more know-how! I knew when I wanted to make a punch recipe that it had to have orange as a main flavor, lots of champagne, and be a beautiful centerpiece for a party. I’m nostalgic for a glass bowl full of fizzy sherbet punch, so I still wanted to include lots of fruit and bubbles in my version. 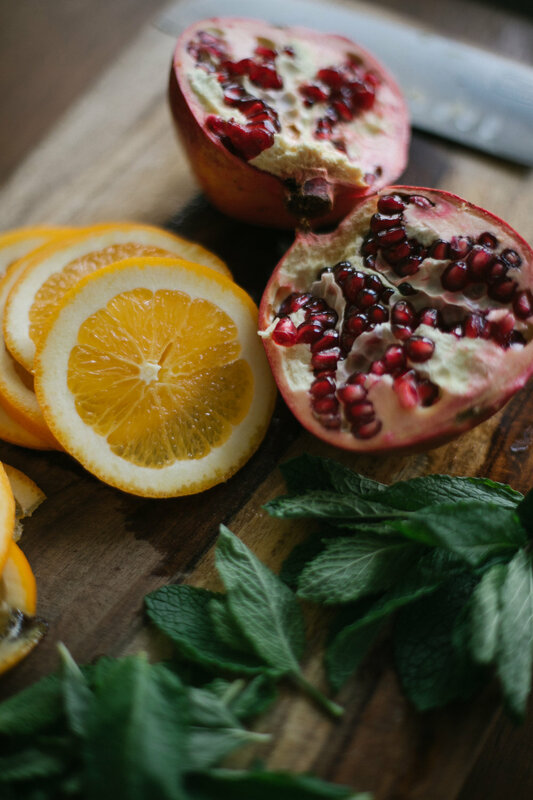 The pomegranate and mint with the orange made for a beautiful winter palate & tasted amazing together too. Whether it's for a dinner party, bridal shower, holiday get together, or just because — this punch is going to be my new classic staple. Hope you'll serve it at your next celebration! Mix the pomegranate juice, orange juice and orange liqueur in a large punch bowl. Add the chilled champagne and stir. Add slices of orange, pomegranate seeds, and mint leaves to the juice and serve.